Social media has became a large part of our lives. We tend to spend most of our times by logging on to these social media. It's become a place where we share our good news, rants and also any information. Marketing and advertising has also begun using social media as there is where the audience are. 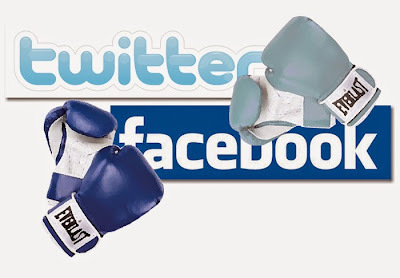 I would go for Facebook anytime rather than Twitter because it is user friendly. It's easier to understand how to use Facebook better. In Facebook, there aren't limitations of characters to the status. In my opinion not many people use Twitter compared to Facebook. It can be both a plus or minus point for anyone, it depends on the individual. Twitter is just Facebook where all you can do is only to update statuses. Twitter is mostly for celebs. So if you wanna get to know more about them then it's better to use Twitter. Otherwise, it's just Facebook. My view on Facebook and Twitter are totally different. To whoever using Facebook and Twitter, would know the difference. It is not as social as Facebook as whatever you post on Facebook is posted on your wall and the whole world will be able to see it. Whereas on Twitter, it is the same, but only on a smaller scale. If it was to be shrink down to simpler terms, a Facebook status would be a report and a Tweet would be a small sticky notes. The character limit is also what differentiates Twitter and Facebook. Whereas Twitter has this "140 character limit", so that could be a struggle at times. Facebook also allows us to have groups and share files (which is beneficial to university students) whereas Twitter doesn't have that option. Besides, personally, I feel Twitter is like having a conversation on your own (where it is acceptable in the Twitter world) and hope other people joins your conversation. We can post tweets like "Going to go to bed", "Feeling hungry", "That guy is mad" in just mere seconds, or even go to the extent of cursing, and nobody would seem to bother, because it is totally acceptable in Twitter. but the same status being posted on Facebook and people will think you are mad. As mentioned earlier, privacy is one of the major difference in the usage of both Twitter and Facebook. As most people use Facebook, it's hard to keep your personal life in tact when there are always people lurking around your profile looking to capitalize on your wrongly interpreted status. In Twitter, you can always tweet it out of having the feeling of insecurity as everyone does it. Mostly, Twitter is a place to rant all your problems. Twitter is also a place to get to know what the world/ your country us talking about. As the "Trending Now" option is available in Twitter, we can see what people are actually talking about. Because of that feature, I got to know about the latest MH 179 incident (2 weeks ago), where a disruptive passenger caused Malaysia Airlines Flight MH179 en route to Colombo, Sri Lanka to mae a turn back. At the same time, nobody posts it on Facebook because maybe the news are only known to a few people. Personally, for university life like mine, I would prefer Facebook as I can get to keep in contact with my friends and also exchange lecture notes in the groups that I am in for study purposes, If I was feeling lonely, would like to "rant", or would like to know the latest trends in the word, I would choose Twitter. As all of us know, there is no words limit in Facebook. So it is the place to rant and to share your marvelous stories and what not. Twitter on the other hand is very limited and hence can’t really be used to rant and instead used to give people a glimpse of the situation the tweeter currently in. I feel that it is more easier to tweet what I am feeling currently rather than ‘faceboking’ it. Other than that, following key persons and key organizations important to both my studies and future career as well as for entertainment is easier in Twitter as their tweets are instantaneous and the usage of hashtags makes the news spread fast. The incident of MH370 and MH17 surfaced in Twitter way before it did in FB. These are the cases where Twitter stands out. But Facebook proves its edginess when it comes to photo sharing. Basically, it's a medium used by people to connect with one another and to share thoughts, ideas and experiences. However, it's often misused by some people. Personally I prefer Twitter because it's more personalized and I have the opportunity to express myself.